Colour enhancing filters and lenses for food. This filter makes the light hotter by reducing the blue component of the light source. Especially studied for lighting bread and oven products since they exalt the brownish colour of the bakery exhibited on the shelves. This filter makes the light colder by reducing the red component of the light source. The filters belonging to this line are suited for lighting sh as they exalt its typical white- blue shade. In the RLight filter (blue line), the green wavelength emitted by the source (black line) is lowered while the red component is let passing through the filter as is. The effect is synthesized by the red line. 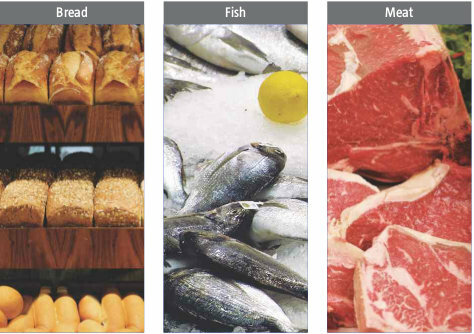 Coupled with the right light, those filters are especially suited to show meat, salami, ham, red fruit, etc.